Sometimes known as absorption nebulae these are dark concentrations of gas and dust which often have stars forming inside them. Dark nebulae can be seen if they obscure part of a bright nebula (eg. the Horsehead nebula) or if they block out background stars (eg. the Coalsack). Here is a map showing many of the dark nebula regions within 2000 light years plotted onto the galactic plane. The map shows the positions of 742 dark nebulae listed by Dutra and Bica. A few bright nebulae are also marked. These dark nebulae are the important regions of star formation in our local part of the Orion Arm. For example, the famous Pleiades star cluster consists of hot young stars that formed among the dark clouds of Taurus. References: Dutra C, Bica E, (2002), A catalogue of dust clouds in the Galaxy, Astron Astrophys, 383, 631. References: Dame T, Hartmann D, Thaddeus P, (2001), The Milky Way in Molecular Clouds: A New Complete CO Survey, Astrophys J, 547, 792. Column 1: The Barnard classification number of the dark nebula. Column 2: The common name of the dark nebula. Column 5: Galactic longitude of the nebula. Column 6: Galactic latitude of the nebula. Column 7: Angular size of the dark nebula in arcminutes. Column 8: Distance to the dark nebula in light years (very approximate). Column 9: Constellation in which the dark nebula lies. nebulae, Astron Astrophys Supp, 113, 325. The Pipe Nebula. 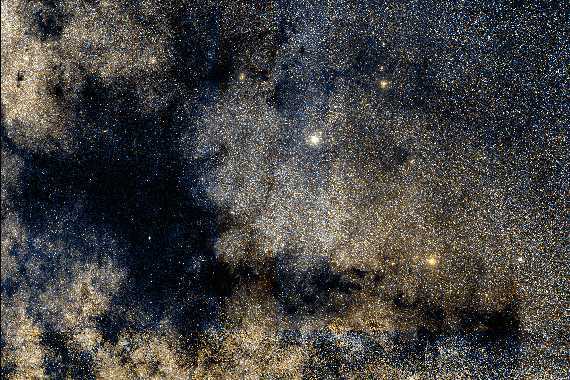 A long dark nebula visible in the star clouds of Ophiuchus.